Yoho National Park in British Columbia is often a side trip from nearby Banff National Park, at least it was for me. After my visit there, I know that the next time I visit the Canadian Rockies, Yoho will more than just a side trip. The main attraction in the park is Emerald Lake which is the largest of the 61 lakes that are contained within it's borders. 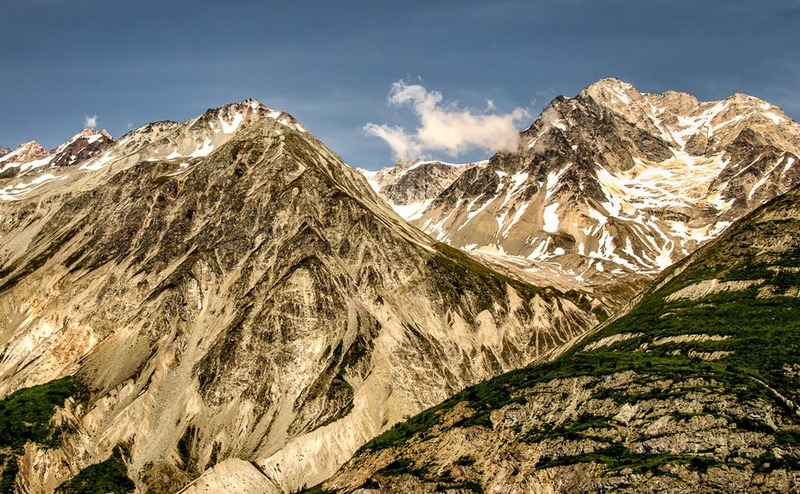 The lake is surrounded by the mountains of the President Range, as well as Mount Burgess and Wapta Mountain. The lake derives it's name from the color of the water which is most vivid in the summer. Due to its high altitude, the lake is frozen from November until June. I have previously posted images of the smallest and least famous national park in Alberta, Waterton Lakes National Park. 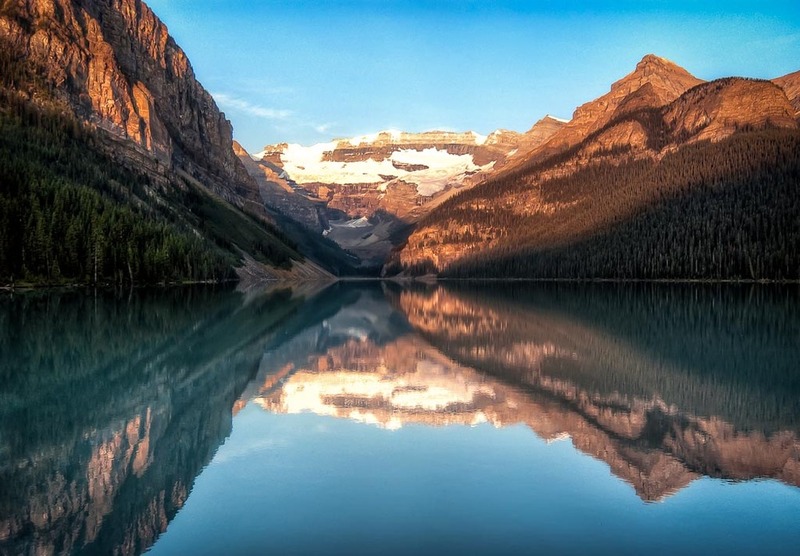 It's location in southern Alberta, makes it a forgotten park when compared to Canada's national parks to north (Banff & Jasper) and the famous U.S. Glacier National Park that abuts Waterton. While Waterton is famous for it's lakes, It would be a mistake not to mention the mountains that are prevalent throughout the park. We stayed at a quaint lodge in Waterton Townsite and really enjoyed it's location on Upper Waterton Lake and the majestic mountains that surround the town. I had to get a shot of the town and this location provided the perfect viewpoint. Also pictured is Emerald Bay just to the foreground to the town. At the end of the Akamina Parkway in Waterton Lakes National Park, Alberta, is the secluded Cameron Lake. 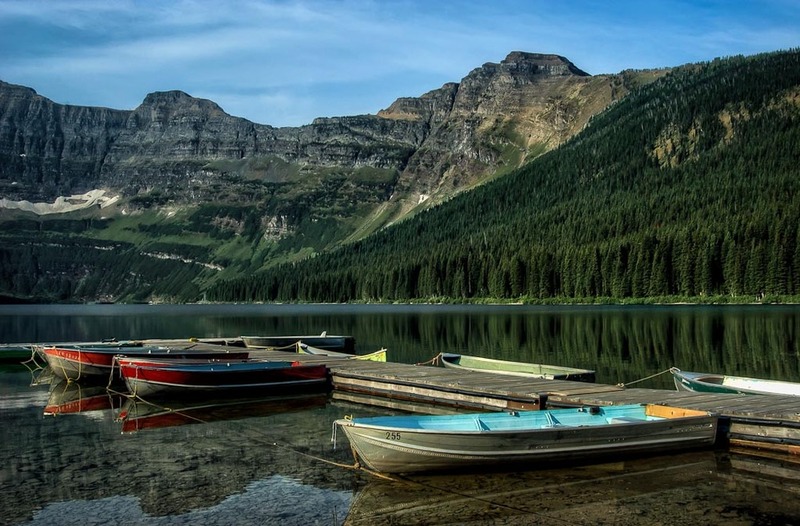 Often overlooked by its two more famous national parks to the north (Banff and Jasper) and the adjoining Glacier National Park in Montana, Waterton is a hidden gem. Being overshadowed as a park adds a great laid back atmosphere to its wonderful and compelling attractions. For example, this image of Cameron Lake was taken in the middle of the summer around 10 am. There were only a few people at the lake and, as can be seen by these empty boats, one could just walk up to the dock, hop in and have the lake almost all to themselves. Try doing that in Glacier. The backdrop of the mountains make this such a wonderful place to spend time relaxing and taking in Mother Nature. If you haven't visited there yet, make sure to add it to your next trip to Montana or Alberta. 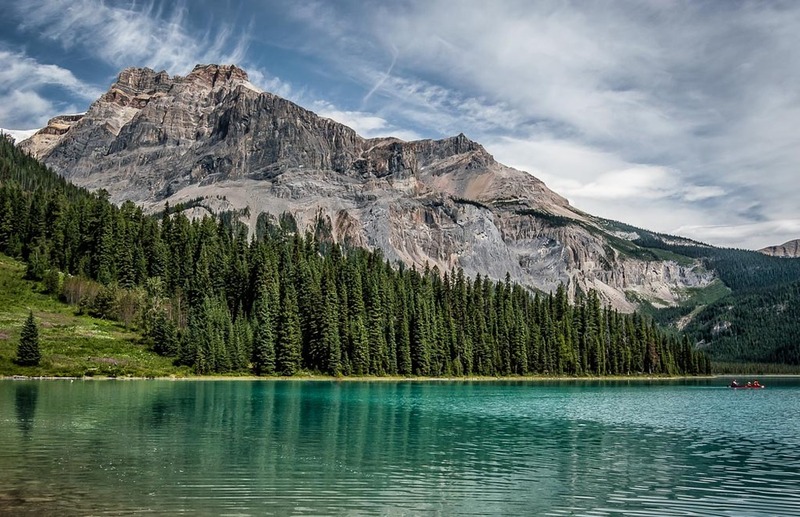 There are so many beautiful lakes that can be found along the famed Icefields Parkway that connects Banff and Jasper National Parks in Alberta. Everyone has a a favorite and mine is Peyto Lake. Located about 25 miles north of Lake Louise, the viewing area can be found off the parkway and is well marked. Park your car and climb the short distance to this viewpoint and you are greeted with this scene - one of the best views in Canada (in my humble opinion). The lake is located in a valley that is surrounded by magestic mountains and forests. The water source for the lake is the Peyto Glacier (located to the left of this view) which gives the lake a magnificent blue-green color due to the mineral content. On our recent southwestern trip, we headed out of Monument Valley for a full day of driving to Albuquerque, New Mexico. We had planned to stop at Canyon de Chelly National Monument in northeastern Arizona but there were really high winds and visibility was almost nonexistent. As we reached the town of Chinle, we decided to stop at the canyon anyway. Amazingly, the wind seemed to stop and we were able to drive the full length of the south rim. For those who have never visited this National Monument, it is a majestic canyon lined with towering red sandstone. It is unique in that it is owned by the Navajo Tribal Trust Land and is administered by the National Park Service. The highlight of the canyon is Spider Rock which can be seen at the very last lookout on South Rim Drive. Spider Rock is actually twin 800-foot towers isolated from the canyon walls. Navajos believe this is the home of the Spider Woman, who taught Navajos how to weave and also devoured disobedient children. It is said that the white caps of the towers are children's bones. Yosemite National Park is one of nature's most beautiful places. Yosemite Valley, where most visitors head, offers more natural wonders than just about anywhere else. From most spots in the valley, one can see El Capitan, Yosemite Falls, Bridalveil Falls, Sentinel Dome and Half Dome. All of these have been photographed many times over and it is very hard to get an original perspective. One of my favorite "off the beaten path" places in Yosemite is Olmsted Point. This location is about 45 miles from Yosemite Lodge on Tioga Road. Olmsted Point looks southwest into the valley giving a view of the northern side of Half Dome and a view of Tenaya Lake to the east. On this particular evening, we had eaten dinner in Lee Vining (home to Mono Lake) and we were heading back to the valley. I just had to stop at Olmsted Point when I saw the beautiful glow of the setting sun on Half Dome's sheer face. Rainbow Bridge National Monument, located near Page, Arizona, is one of the world's highest natural bridges with a height of 290 feet. It is almost as long as it is high with a length of 270 feet. Rainbow Bridge was known by Native Americans who have long held the bridge sacred as a symbol of the deities responsible for creating clouds, rainbows and rain--the essence of life in the desert. They named the bridge "Nonnezoshe" or "rainbow turned to stone." One of the natural wonders of the world, the bridge was formed by erosion of the sandstone by water flowing from Navajo Mountain towards the Colorado River. Rainbow Bridge can be reached by a two-hour boat ride on Lake Powell from either of two marinas near Page. After a wonderfully scenic ride on the lake, boats drop you off at the National Park wharf in Bridge Canyon and, to reach the bridge, there is short mile-long walk. The only other alternative is to hike several hours from a trailhead on the south side of Lake Powell but requires a permit from the Navajo Nation. When planning for photographing the bridge, I realized that I would not be able to shoot it in great light as the earliest boat reaches it at almost 10 am. For those of you that have seen images of the bridge and it's reflection in the water, it is not possible to capture. One of the Park Rangers told me that due to the low water levels on the lake, the last time water flowed through the arch was almost 20 years ago. Regardless of the not perfect light and lack of water, the bridge is still an impressive subject. So how do you capture the magnificence, vastness and the wonder of the Grand Canyon? The answer is that you don't. The best that you can do is to capture a small slice of the canyon and hope that a little of it's beauty comes through your image. There are two times to best photograph the park: sunrise and sunset. When the sun is near the horizon, it's light casts long shadows and adds great definition and depth to the canyon walls. Any other time, photographs seem flat with little or no definition because the sun is higher in the sky thus casting very shallow shadows. This image was taken just before sunset from Yavapai Point on the South Rim of the canyon. The sun cast a great golden glow onto the rocks creating terrific long shadows in the canyon itself. While many shoot into a rising or setting sun, my tendency is to shoot away from the sun to capture the great warm tones on the surrounding scenery. I know that I have been posting a lot of images from Alberta but I can't help it! I just love the Canadian Rockies and it's surrounding lakes and towns. I would probably go to Banff every year if my wife said it was okay. Okay, now that I have warned you, today's image is of Cascade Mountain from the town of Banff. It was very early in the morning, shortly after sunrise. The town was pretty deserted, especially for a summer morning. I am sure that it is very hard to shoot a bad photo when the subject is so magnificent, the light so nice and soft and the weather being just about perfect. Just another day in paradise (at least to me). The Merced River is a 145-mile tributary of the San Joaquin River flowing from the Sierra Nevada to the central valley of California. The most famous section of the river is where it travels through the renowned Yosemite Valley in Yosemite National Park. The Merced drops over the Nevada Falls and Vernal Falls and passes into the valley, where it flows in the pine forests that fill the valley floor. Visitors to Yosemite Valley can go almost anywhere along the Merced's banks and see the famous granite cliffs and formations. This image shows one of the most famous formations, El Capitan. It was early morning and the light started to bathe the formation and the opposite bank. It's no wonder that the Yosemite Valley is one of the most visited national parks in the US.